Ronnie was the favourite going into the Final, based on their previous head to head, but Shaun had other ideas. He beat Ronnie by 10-8, having been the strongest player on the day. Shaun managed to win the close frames and his potting from distance was scary; those were two big factors in the match. Ronnie looked edgy and couldn’t reproduce the form he showed in earlier rounds, he didn’t have the best of run either, but he had no complaints. Shaun totally deserved the win. One thing though to Ronnie’s credit is the attitude he showed, the way he fought back especially from 9-5 down. He was clearly frustrated with his own mistakes but, again and again, refocused, tried his hardest and battled to the very end, which earned his appreciative comments from both Stephen Hendry and Clive Everton. 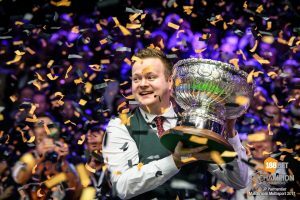 Shaun Murphy survived an almighty Ronnie O’Sullivan fightback to win the 188BET Champion of Champions at Coventry’s Ricoh Arena. The Shanghai Masters has already begun. Ronnie is traveling there today. His first match has been pushed to Wednesday morning, that will be around 3:30 am UK time and still middle of the night according to his body clock. And, should he win, he will probably have to play again on the same day… if he wins just one match, he’ll do well. I’m not too hopeful. Thanks for a great tournament Ronnie. There is no one I’d rather watch play snooker. I hope you keep playing for many more years. Best wishes. Well done, Shaun Murphy. I actually rooted for Shaun against Luca Brecel because I thought Ronnie would have an easier time against Shaun than Luca. Silly me. I sure hope that next year’s schedule makes more sense than this year’s. There’s no obvious reason why the China events couldn’t be back-to-back instead of alternated with events in the UK. The Champion of Champions is a Matchroom event, not a Worldsnooker event, so I’m not sure if the same rules apply. But, yes, crazy schedule. I see, thanks. Yeah, Mark (above) is right, they should make back-to-back Chinese events and the same for the UK: tennis at least has seasons on the same continent. But I have hope they will change it to obey common sense a bit. For that to be possible, the full tournaments should be played at the main venue, never-mind where that is. Just think about the logistic nightmare for players if they qualify, in the UK, say for Wuxi, but not for Guangzhou, are playing in Daqing, but not in Shanghai, and well in Beijing. They’ll have to stay in China, idle, maybe without easy access to practice facilities, at their own expenses for weeks … or travel back and forth which would defeat the very purpose of “grouping” the events by Continent. Congrats to Shaun, well done. And as well to Ronnie – Well done, too, proving his fighting spirit. Or did I miss anything? Anyway as to headline of the CoCo website Shaun is the winner, but then as they note the breaks it reads SM 8 – 10 ROS. Too good to be true … Funny isn’t it … ;-)? However, now it’s Shanghai, try to enjoy, Ronnie, however it goes. And again, Thanks to dear Monique for keeping us informed ! Would happy to skip the Shanghai Masters. A week rest before the big UK events would be very useful. Yeah, the same he said about Selby that he should have skipped the Champion of Champions after he won and stayed in China. Would it have been really bad on his part to withdraw? On the topic of yesterday’s final: it was clearly not his day, and luck was against him except in one case. Truly admirable the way he fought though.